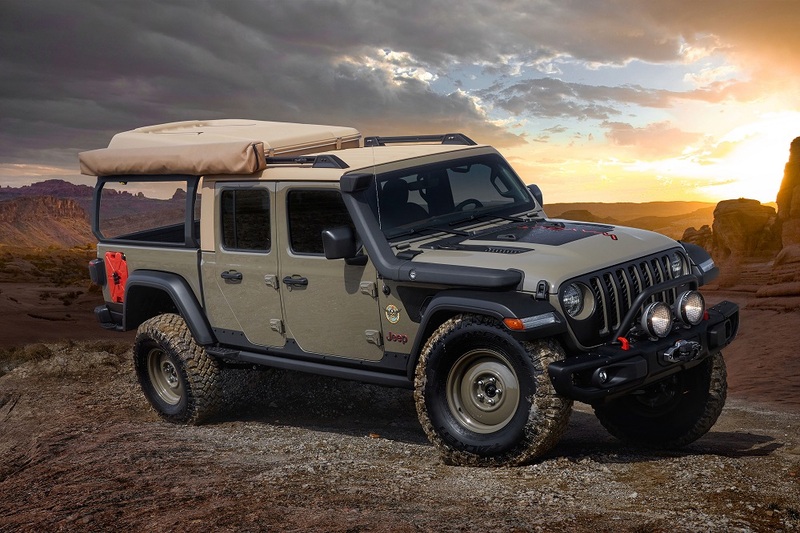 For the 2019 Moab Easter Jeep Safari, Jeep Gladiator is taking center stage with multiple concepts spotlighting the all-new Jeep truck. For the 53rd year, thousands of off-road enthusiasts will head to Moab for the annual Jeep event to participate in a week of technical off-roading on some of the most challenging and scenic terrain in the country. The annual event takes place in Moab, Utah, April 13-21. The Jeep Wayout showcases a full roof-top tent and custom sprawling canopy. Wayout features a body armored exterior in a new Gator Green color that will be available on production Gladiator models and a custom bed rack with an integrated ladder to the roof-top two-person tent. The 270-degree awning with amber LED task lighting aids setting up camp at the end of the day. Other elements include two custom-fit auxiliary fuel tanks integrated into the bedsides, two-inch lift kit, 17-inch steel wheels with 37-inch mud-terrain tires, 12,000-lb. Warn winch, snorkel, custom integrated roof-rack system, Mopar/Decked bed-drawer system in the truck bed, bed-lined floors, plus trimmed brown leather seats with laser-etched inserts of topographical maps. 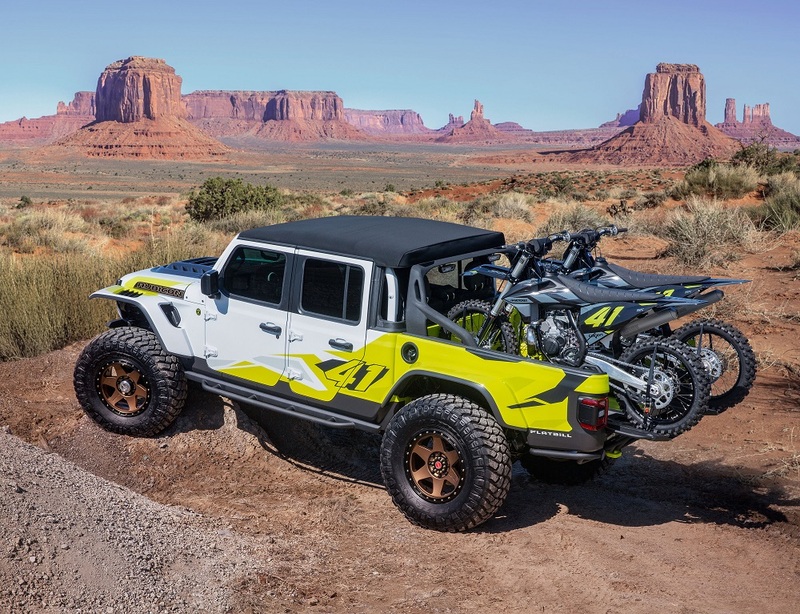 Targeting a desert lifestyle, the Jeep Flatbill concept is Motocross focused with an unmistakable, loud and rowdy appearance as the ultimate hauler for an array of toys. Powered by the 3.6-liter Pentastar V-6 engine with a cold-air Mopar intake and mated to an eight-speed automatic transmission, the exterior features a vented carbon hood and high-clearance flares, while a custom-designed shortened front bumper and skid plate improve the approach angle. The Jeep Flatbill is equipped to handle transport of dirt bikes for off-road adventure as seen by truck bed loaded with a pair of dirt bikes. Dedicated wheel ramps slide out for easy access and loading. Custom body work on the bed lowers, plus the addition of a tube rear bumper, increases the vehicle’s departure angle for added capability. Mechanically, Flatbill uses Dynatrac Pro-Rock 60 front and rear axles, an Off-Road Evolution custom four-inch lift kit, large rear bypass shocks and 20-inch wheels mounted with 40-inch tires. Inside, bright bed-lined floors plus custom-trimmed seats create a fun and sporty environment. The Jeep M-715 Five-Quarter “Resto-Mod” is Gladiator-based with a blend of vintage and modern components that give a historical nod to Jeep trucks of the past that were one-and-one-quarter tons or “five quarters.” It is powered by the HEMI “Hellcrate” V8 producing more than 700 horsepower. This 1968 M-715 reimagining includes a full carbon-fiber front end taking the place of the original front sheet metal. An all-new, bobbed 6-foot custom-fabricated aluminum bed features a mix of water jet cut panels and wood slats. Other modifications include a 3.5-inch drop to its convertible soft-top, new HID headlights, LED auxiliary lights plus LED halo lights in the original taillight buckets. Protecting the body are functional rock rails running the length of the body side. Jeep Gladiator Rubicon modified steel bumpers complement the brushed metal-finished body and tailgate finishing the exterior. Off-road capability is enhanced by a reinforced original frame and a heavy-duty link/coil suspension system. Front axle placement is two inches forward using a Dynatrac Pro-rock 60 front axle with a Dynatrac Pro-rock 80 axle in the rear. On the ground are 20-inch beadlock wheels wrapped with 40-inch tires. Inside, Jeep Wrangler seats, sans headrests provide a sleek, low-back visual. Additionally, water-jetted aluminum components form a new lightweight and premium instrument panel and door panels. 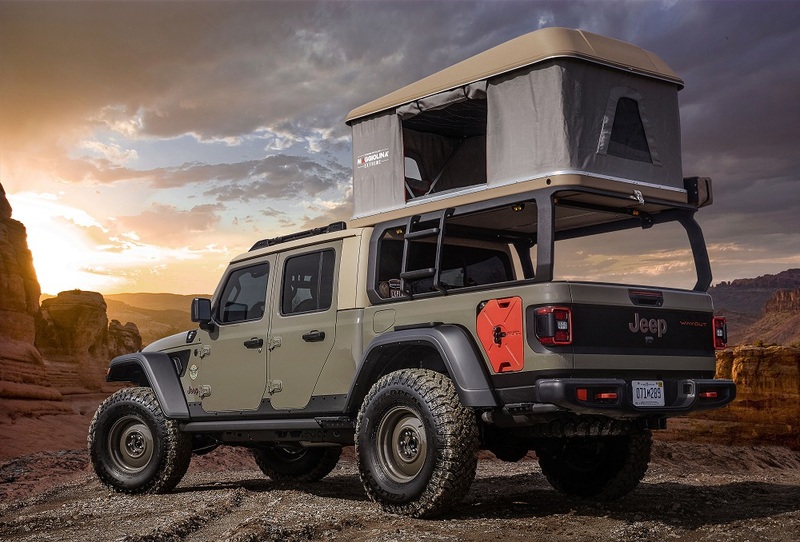 The Jeep J6 concept is a Rubicon customized into a two-door configuration, that maximizes cargo space with a six-foot functional bed that is 12 inches longer than the standard Jeep Gladiator bed. With a nod to the 1978 Jeep Honcho, it sports Metallic Brilliant Blue paint and an upsized bed area with a matching spray-in bedliner. A two-and-a-quarter-inch steel prototype sport/roll bar in the bed carries a set of four, five-inch LED lights that shine at 4,800 lumens each. A prototype spare tire carrier stores up to a 37-inch tire. Prototype 17-inch beadlock wheels with “deep dish” design feature a contrasting Brass Monkey finish and silver beadlock ring. A two-inch lift kit enables the fitment of aggressive 37-inch tires for extra trail clearance. 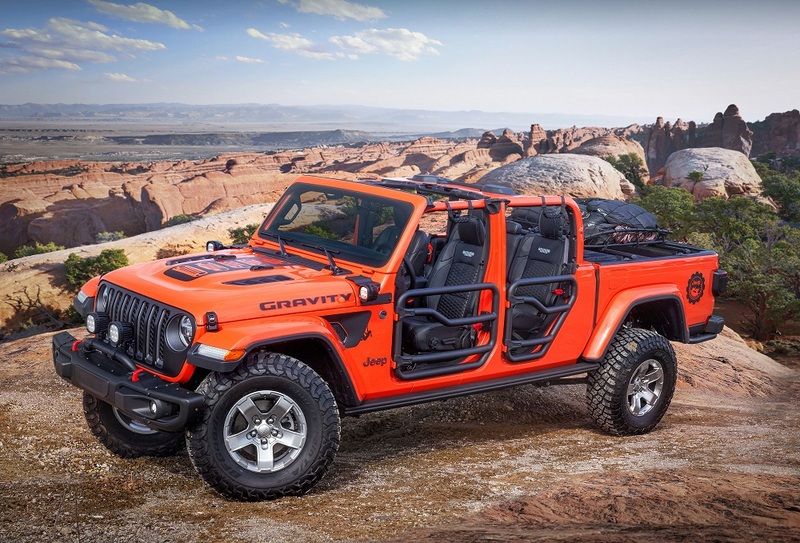 Other features include a prototype two-inch steel stinger bar bolted to the Rubicon front bumper and rock rails customized with two-inch steel tubes welded to the standard Jeep Gladiator rails. A concept hardtop is removable, and classic Jeep J6 badging is swapped in on the tailgate and side fenders. 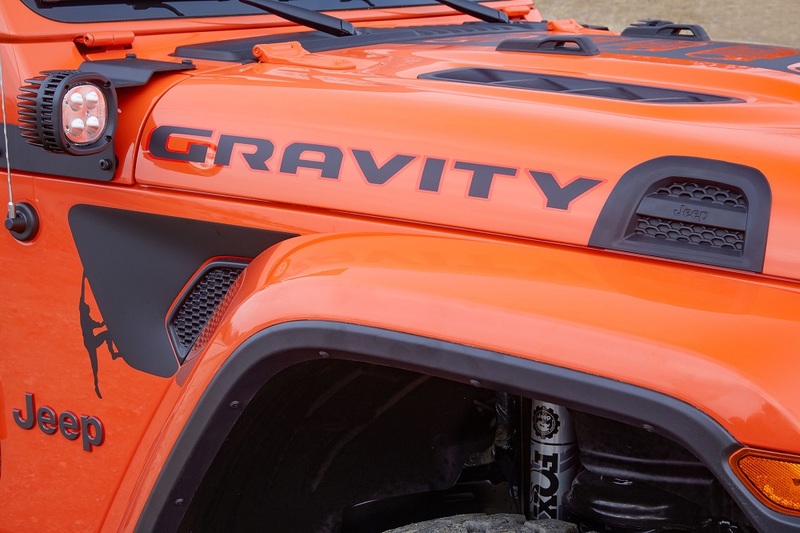 Additional trail lighting is by four – stinger bar mounted – five-inch Jeep Performance Parts LED lights, plus another two on the A-pillars, for a total of 10 five-inch LEDs on Jeep J6. The grille is custom Mopar Satin Black, and the stock Jeep Gladiator Rubicon hood is accented with Jeep logo hood latches. Inside, the instrument panel inserts match the body color and Katzkin leather seats and armrests are accented with body-color blue stitching. The horn pad is customized with a classic Jeep badge. The auxiliary switch bank offers a central operating location for the 10 LED lights with a bright pedal kit, all-weather floor mats and Jeep logo molded doorsill guards complete the package. 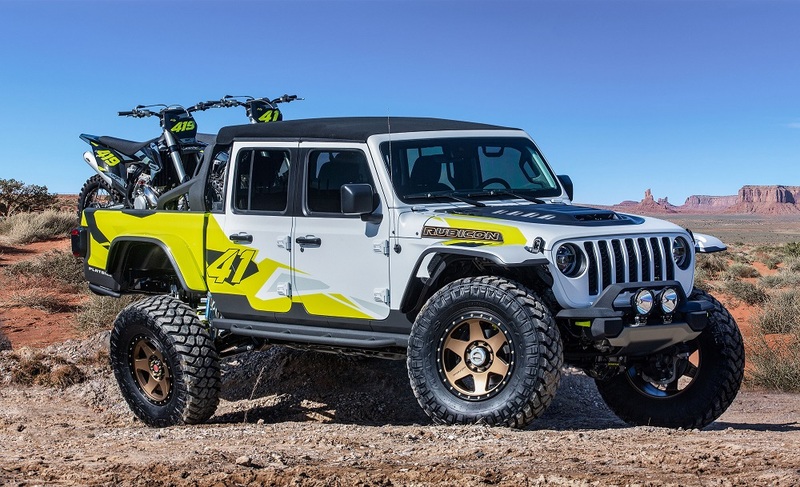 The Jeep JT Scrambler concept is a remix based on the Jeep Gladiator Rubicon and carrying the throwback color palette and graphics of the iconic CJ Scrambler crossed with conceptual touches. The white exterior surface features Prototype Punk’N Metallic Orange and Nacho body-side stripes and a matching hood graphic. A Freedom Top painted in vintage amber, continues the retro feel. The bed area has a spray-in bedliner and a two-inch steel, prototype tube sport/roll bar painted body-color white. Diffused LED task lights mounted to the sport/roll bar are directed to the rear bed, providing illumination in the cargo area. Performance parts include a set of four five-inch LED lights atop the sport/roll bar with two the A-pillars. On the brush guard are a pair of seven-inch 8,000 lumen LED lights. A two-inch lift kit enables accommodation of 17-inch slotted wheels in a concept bronze, mounted with 37-inch tires. Inside, Katzkin Amaretto Brown leather seats are bordered in orange thread, with Jeep grille logo embroidered in a light Tungsten on the seatbacks. Dash panel and armrests are also in the same Katzkin Amaretto Brown motif. 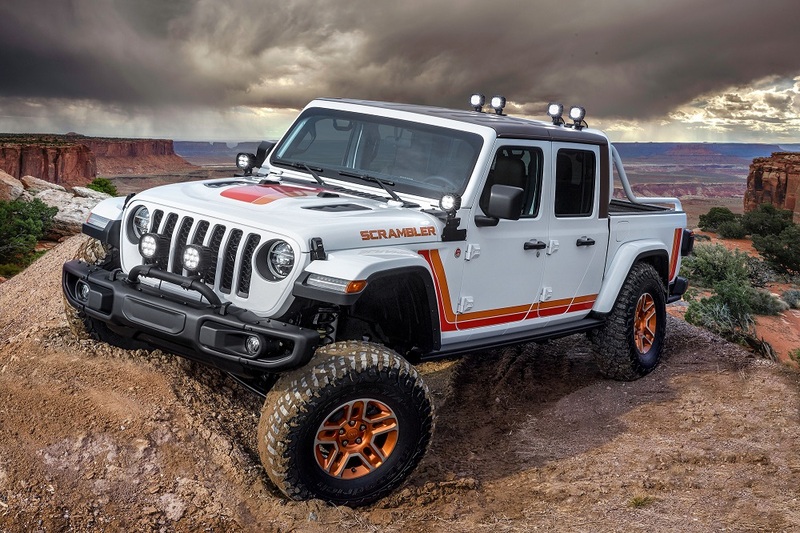 The rock-climber-themed Jeep Gladiator Gravity concept is elevated with a full complement of available-at-launch Jeep Performance Parts from Mopar. The Jeep Gladiator Rubicon, in Punk’N Metallic Orange, is ready-to-order as you see it. In the bed area, mounted Mopar cross rails work with a cargo carrier basket to deliver storage space for rock-climbing gear, such as ropes, carabiners, helmets and shoes. A Mopar/Decked truck bed storage system offers additional lockable cargo space through dual sliding drawers. 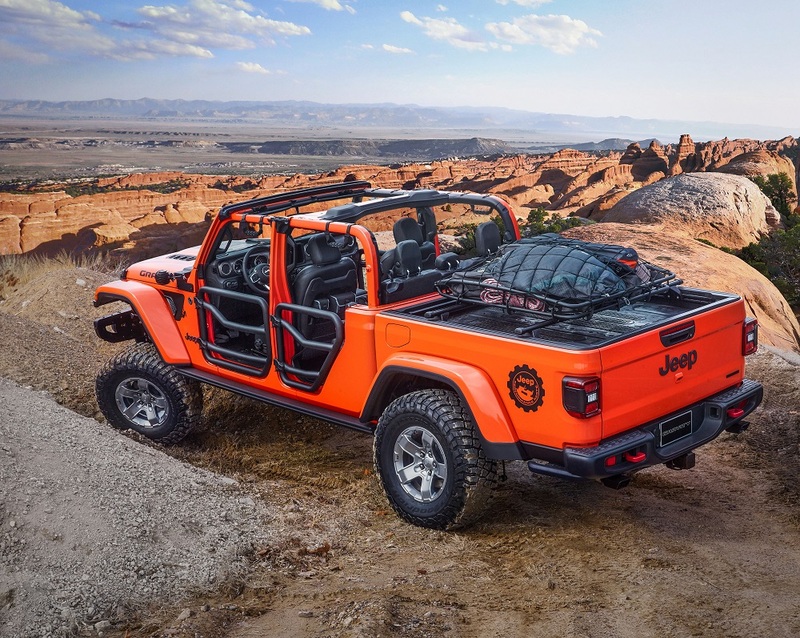 The open-air capability of the Jeep Gladiator is demonstrated through two-inch round steel tube doors, a mesh sunbonnet that provides cover while keeping the top-down feel, and tie-down straps that secure the windshield when lowered. Jeep Gladiator Gravity is raised with a two-inch lift kit and runs on 17-inch gear wheels carrying 35-inch tires. Heavy-gauge steel rock rails (thicker and wider) utilize the powder-coating from Ram Truck bedliners to provide a non-slip finish. In front of the Mopar satin black grille, are seven-inch LED lights augmented by five-inch LED lights on the A-pillars. Katzkin leather seats inside feature the Jeep grille logo embroidered in Tungsten stitching. 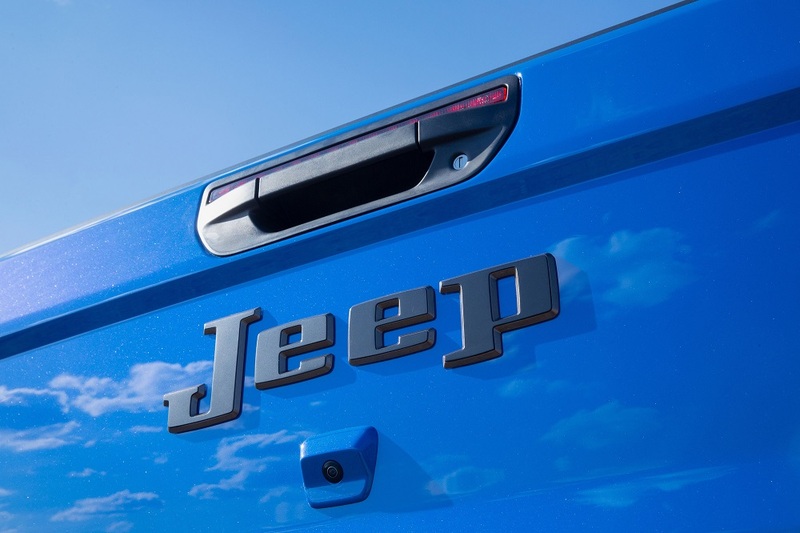 Additional Mopar accessories include grab handles stamped with the grille logo, MOLLE (Modular Lightweight Load-carrying Equipment) bags for storage and all-weather floor mats with a unique “plug” system that allows for direct draining of water and debris. Jeep’n – seven unique concepts for the 2018 Moab Easter Jeep Safari!